It’s been a long-standing tradition that veterans’ groups sell plastic poppies (or give them, in exchange for a donation) to commemorate Veteran’s Day. (Edited: yeah, Memorial Day. Ugh.) I remember going to visit my Grandparents when I was a kid, and seeing a fake poppy attached to my Grandfather’s rear view mirror, in his car. Many times. Back then I had no idea what the poppies were for, but I sure loved them! After a while, he used to let me have them. 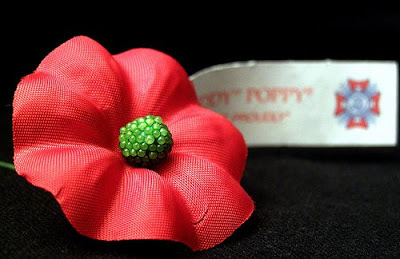 I used to twist the little wire attached to the flower around my finger, so I could wear the poppy like a ring. I fiddled with them endlessly whenever I was lucky enough to get one, until the edges of the flower became shredded (because oh, by the way, when I was a kid they weren’t made of plastic: they were made of cloth!). Sometimes, the center of the flower, which was what was attached to the wire, would totally pop out because I messed with it too much. I’m not sure if any little girl every appreciated those poppies as much as I did! Whenever I see those poppies these days, I think of Grandpa. In fact, I think I just might try to contact someone from our local VFW, to see if they have an extra poppy or two. I’d like to run out and get one. On this day of Remembrance, I want to say thanks to all of our veterans (including my dad and my husband!) for all of their contributions, as well as to our active duty military for all that you do to keep us safe!! Oh how I remember Grandpa with those poppies. The men who served and have served are an outstanding group and to my husband a special thanks for returning from Viet Nam. I love you and God bless. Thanks. I've always seen the poppies, of course, but I never really knew the "why". I never realized poppies were so few & far between in the USA! Here in Canada, today is called "Remembrance Day" and the poppy is by-and-large the biggest symbol (actually, as a kid, we used to call it "poppy day"). They sold poppies in schools (as a donation to war vets), and they still sell them in malls, subways, other public places. It's Rememberance Day here, too, and you can barely get to the supermarket without purchasing at least 3 from the sweet old dears who sell them. We used to have a roster at school for who would help distribute the poppies for sale around town (our school used to help the Veterans Clubs) and it was always an honour to do it. I buy a poppy each year (except this year – I feel bad) and always wonder how my Grandad and his 3 uncles who were all killed could be so brave. It makes me thankful for the things I take for granted that they all fought for, and makes me worry a bit more for one of my best friends, who is due to go on service soon. Very touching remembrances. Thank you for sharing with us. I did some reading up on Veterans Day this year for the sake of accuracy. Turns out, I've been spelling it wrong all these years (there is no apostrophe). And, according to the VA, the poppies are intended for Memorial Day which honors those who have died in service to their country while Veterans Day honors and thanks who have served and are serving- living and dead, died in service, or died otherwise. I hadn't ever thought about it so much but I feel way smarterer for it now. Must be in the DNA somewhere; I buy one from the Vets every Memorial Day, and wrap them around my rear-view mirror!!! There's one in my car right now. Didn't realize the connection to that habit with Grandpa. Wow. It's odd, but I don't think I've ever been anywhere before that had poppies. It does make me giggle that you had a different holiday, but I love this post — and the poem! Next post: This is Probably the Best Blog Post About This Particular Topic. Maybe.